Yesterday was important for many reasons. To one family, it was more important to celebrate Agent (their OwyheeStar Gray Ghost Boy’s) birthday. It was his thirteenth one, and this much-loved boy is looking good for his age. They call him a sweet boy. He was not alone in the celebration. Lily (an OwyheeStar Blue) girl has been around for awhile too. She is not to be left out. So Agent is now 11.4 years of age. Took him to see Dr. Sara Rice , who has seen him since he was 20lbs. She loves him so. Full check up including all blood work. She was amazed at how well he was doing. Agent’s physique and the way he carried himself certainly caught Dr. Rice’s eye. She commented on the muscles in his back and stated “Agent came from excellent Genes and Bloodline”. Dr. Rice also mentioned that if she did not know his birth date, she would guess his age to be around 8. Such great news. Agent gave her his Shake and they parted as good friends as always. I would like to say that Agent Is doing very well as is Lilly. I would like to thank both of you for excellent dogs that are so part of our family. 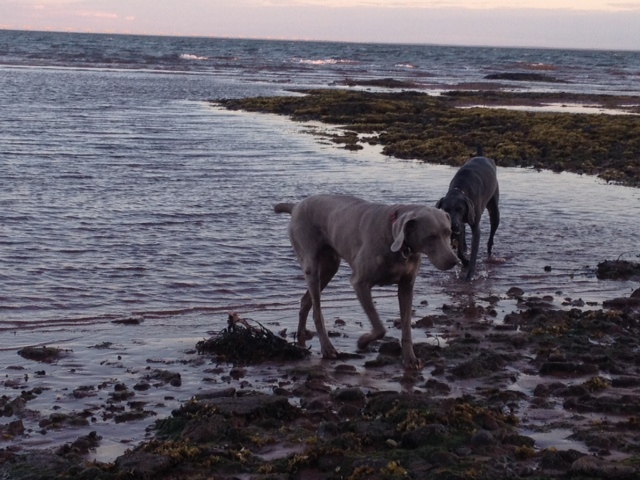 Owyheestar Weimaraners is the Best! David and Sherri H.
Breeder’s Comment: Thank you David and Sherri for staying in touch for all these years, and for this recent update. Agent is awesome. Lily is not too bad. You have done great with them. No one can say how long a living creature will be with us. We all want the longest possible scenario–certainly everyday must be grand. 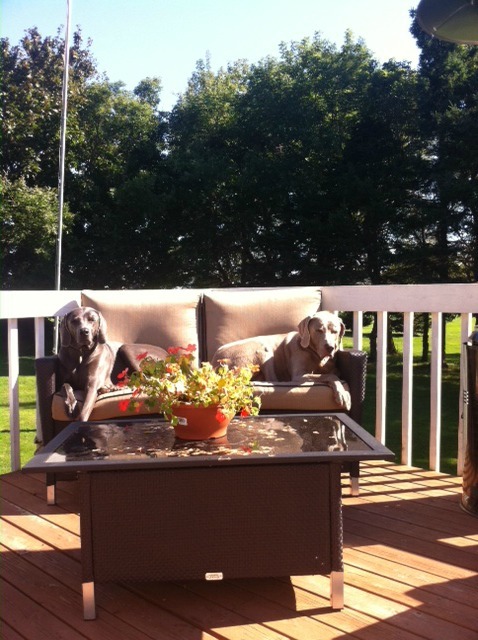 Nevertheless, when a Weim reaches eleven they have beaten the odds; some do not make it this far. As with humans, every year a few depart this world for various reasons. Of course, some are lost to an accident, but a few succumb to a medical issue. We are thankful these two are doing well, and that they bring you joy. Thanks ever so much for the referrals, and for staying in touch. It seems like yesterday when he became part of our family. What a great dog he has been. Lilly too. Wiem hugs from all of us. I wanted to let you know that my amazing boy Kaos passed away last Saturday. There was no sickness or suffering. He was great right up until a few days before. They think he had a tumor that ruptured and then he had internal bleeding that just made his body go to sleep within a couple days. Kaos was loved by all! I can’t even tell you what Kaos brought to our lives. He was one amazing soul and he was loved by everyone around him. Ozzie is adjusting but he sure does miss his best buddy. We are hanging in there as we have nothing but great memories to keep us happy. 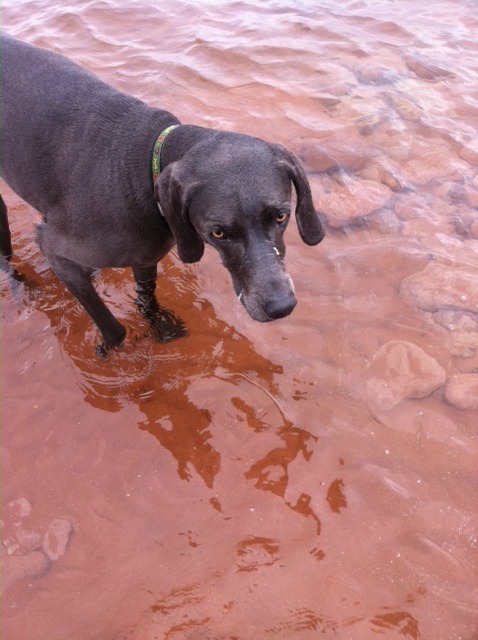 Breeder’s Note: Thank you Sarah for letting us know of Kao’s passing. Of course, we will write you a separate email, but we didn’t want to post this without our sincere condolences for your loss. The unfortunate reality is that something catches up with every living creature. A few beat the odds and live longer than average–some by far. We all know it is inevitable. It is just not the fun part of having critters in our life. Sarah is right. Kaos brought them joy, and they have a boat-load of good memories. The bottom-line is these wonderful creatures make our lives better. 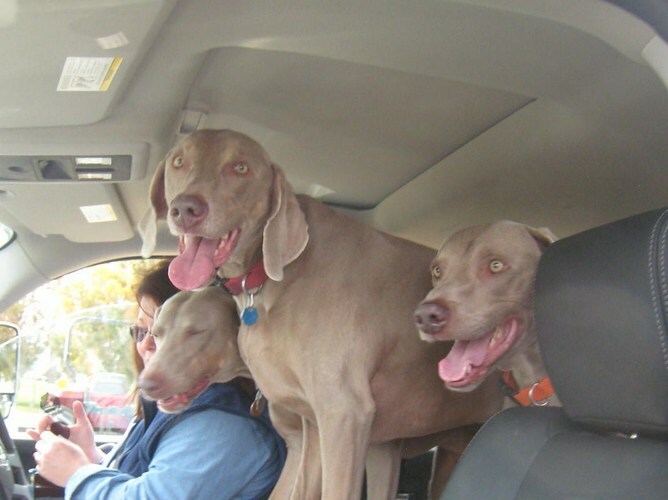 This week our mail brought news of two Weims who recently departed from their earthy family. We suspect they are both busy in the heaven entertaining people with their antics. 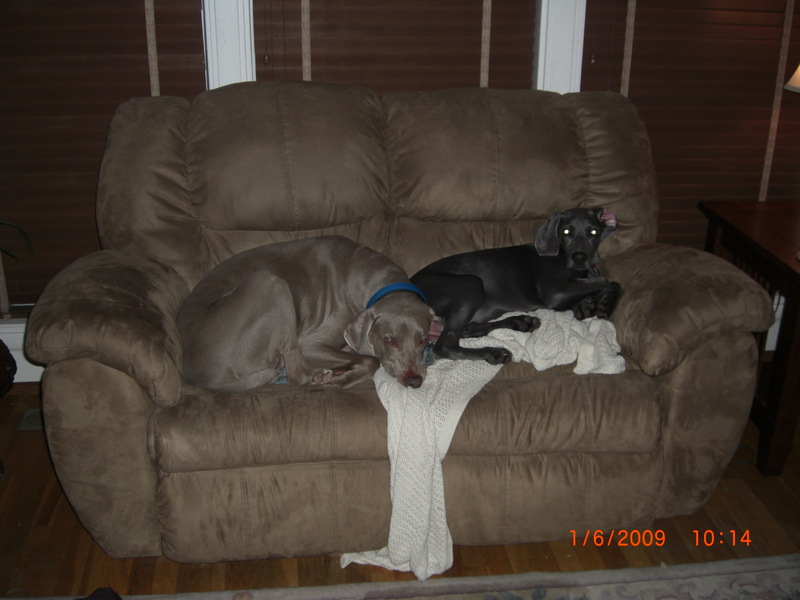 We get notes from people who write us about other Weims that pass too. We hear of problems, and situations. We have gotten notes from people around the world asking us for advice. We do what we can. We do not post or share everyone we receive. Nonetheless, on occasion, we will share some of the less upbeat news. 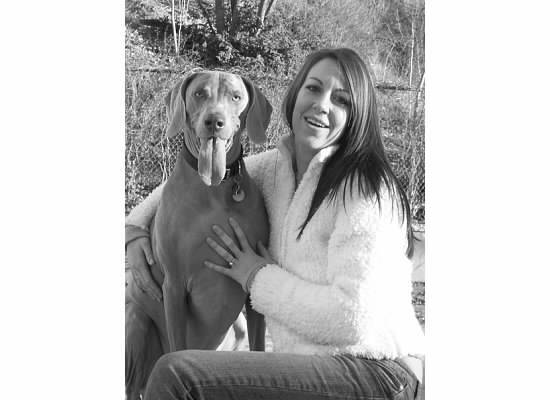 We appreciate everyone who puts so much into giving their OwyheeStar Weimaraner the best of everything. May they live long, and fill your heart with memories to cherish when they must depart. Embrace every moment for we know not how many moments any of us will have in this life. 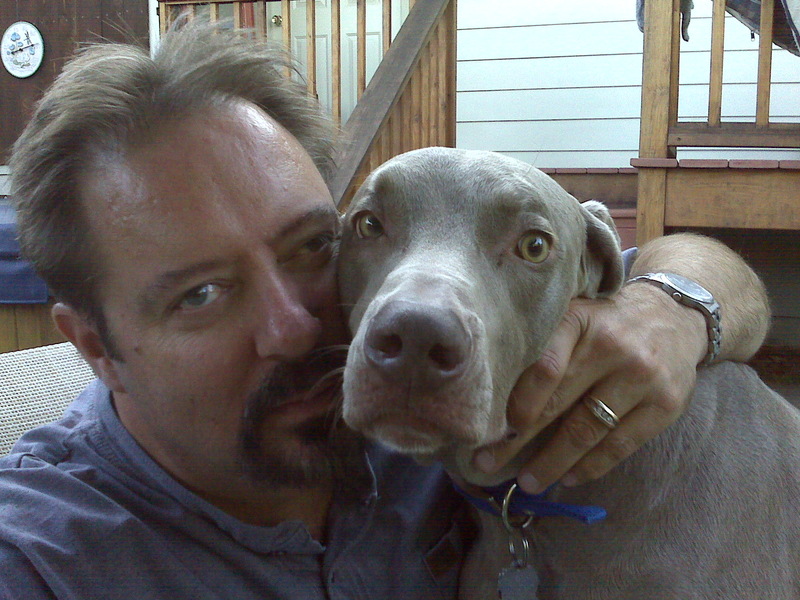 Euthanizing our beloved pet is sometimes the most loving thing we can do. We cannot let them suffer endlessly with no hope of recovery. Knowing when there is no other choice, and when this is the right decision is best discussed with your veterinarian. 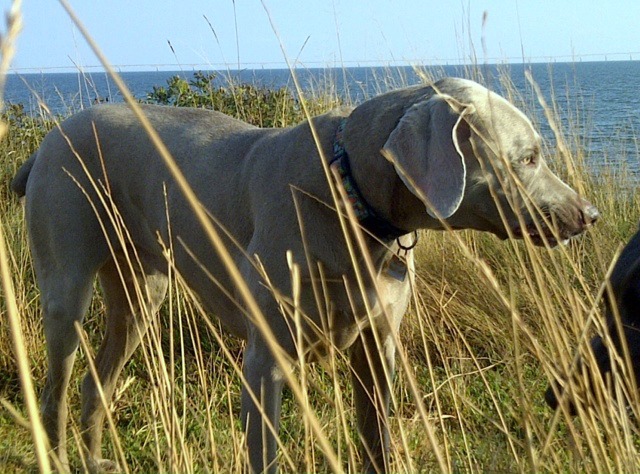 This is a painful topic, but a reality for us that love the Weimaraner. Unless a very bad scenario happens, where your life is cut short, they are destined to leave this world before we do. 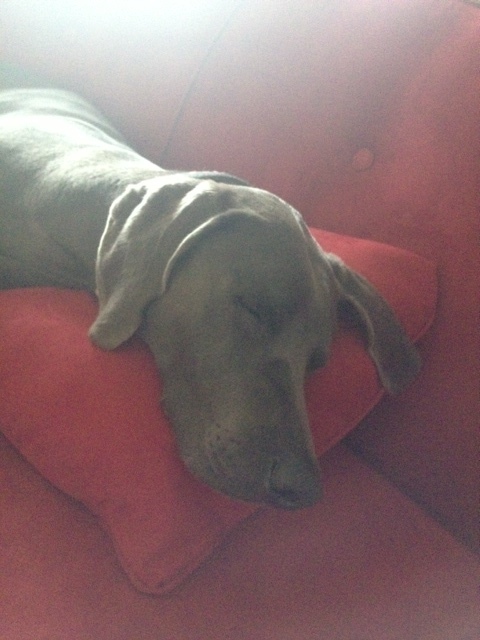 Nonetheless, most of us hope our Weimaraner will be the one to live to sixteen years. In reality, only a few live that long even with the best of care. As with humans, different accidents and illnesses can shorten our lifespan. Each day is a special gift. Forty plus years of raising puppies means that we have received a number of these notes containing news of the loss. 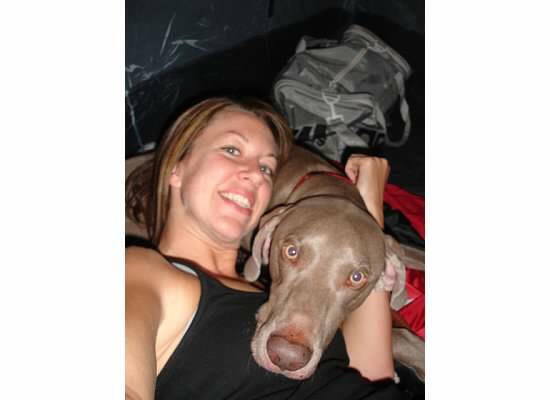 Most are from people we have never met, but some are from our clients who lost their beloved OwyheeStar Weimaraner. There are no adequate words, and phrases to cover these losses. Our heart aches along with the person telling us their story. Whatever the story, the loss is felt deep. There are expenses associated with the loss on every level. Time can seemingly stop. Many individuals are surprised by the impact on their lives. We never take these notes lightly. One came this week, and it was not easy. 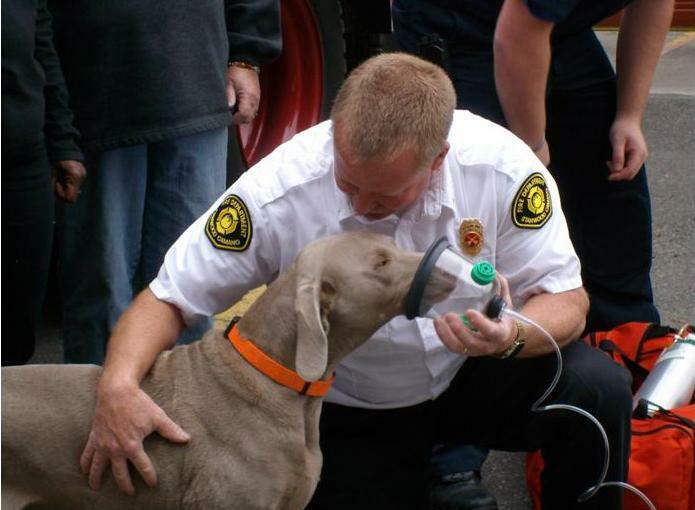 Turbo could not continue his work at the fire station, or his journey any longer. Sadly, Mike and Monica had to say good-bye. They could not leave him to suffer. They provided the best for him every step of the way, but at some point in time it isn’t fair. So, as the skies have seemed to weep over the last couple of days, it seems fitting. Turbo cannot be replaced, but he will live on in our hearts. 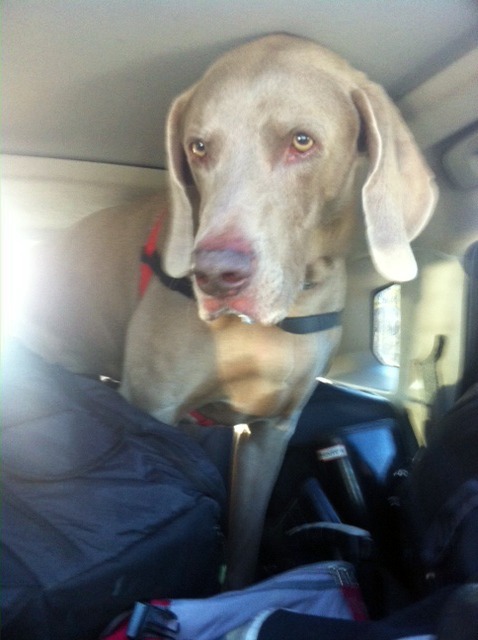 If ever, there was a Weimaraner with the “it-factor” it was Turbo. 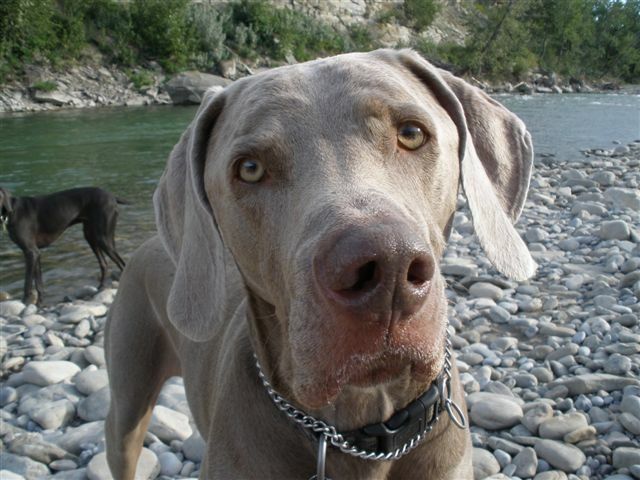 Tags: beloved pet, grieving over pet loss, pet loss, The Weimaraner "it-factor"
Its been a long time since we have had an update on Kaos and Ozzie who reside with me in Calgary. I have included a few current pictures of them. 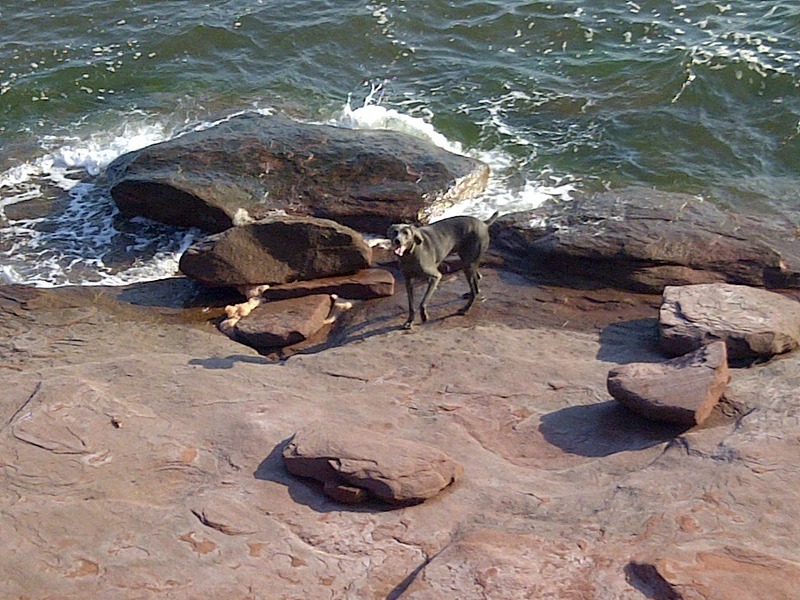 We love going to the Ocean…. I bought a cottage I’m PEI last summer so I drove across Canada with them in my car (5 days). They were awesome. And love the cottage. The freedom to run and the and the ocean. Breeder’s Note: We thank Sarah from the bottom of our hearts. As you can see we have stayed in touch for almost a decade. Many of our clients have been around for more than a decade. Time passes too quickly. 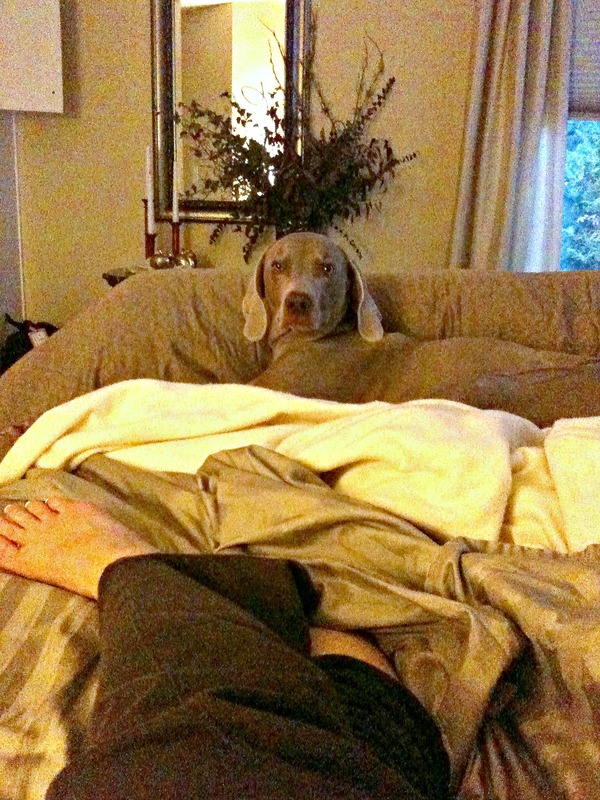 Each day we have with our Weimaraner is a gift. 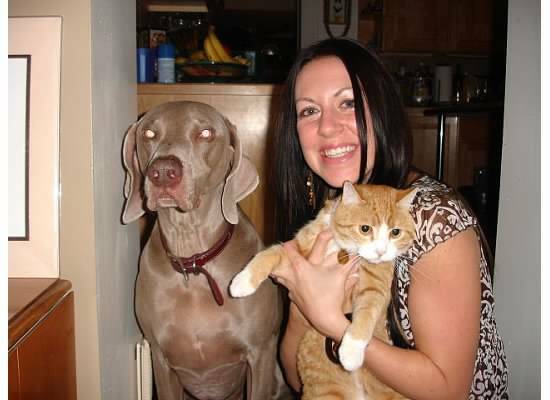 I am sure Sarah would be quick to tell her that Kaos and Ozzie have enriched their lives many times over. Sarah and the girls have included them in each family adventure. 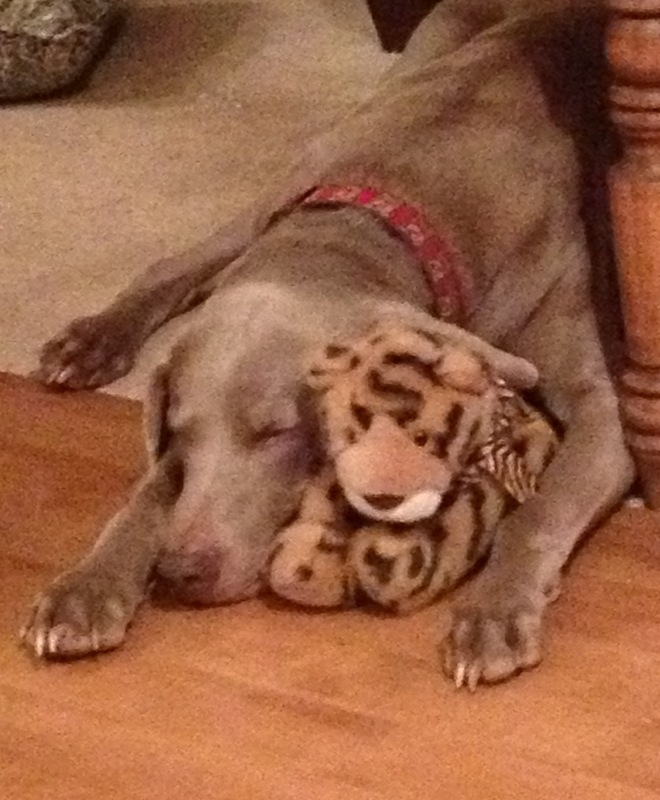 They truly understand the Weimaraner. Twice, they traveled to our home from Calgary. One of the two times (when they got Ozzie) was just prior to Christmas. Over the years, we have seen camping trips and outings. 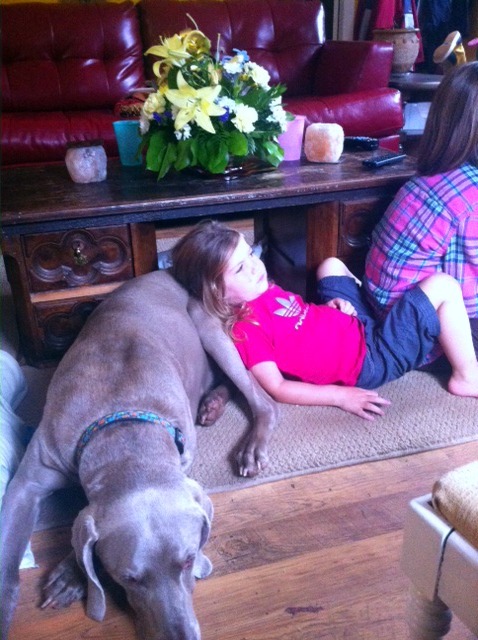 What a great life Kaos and Ozzie have with their very special family! 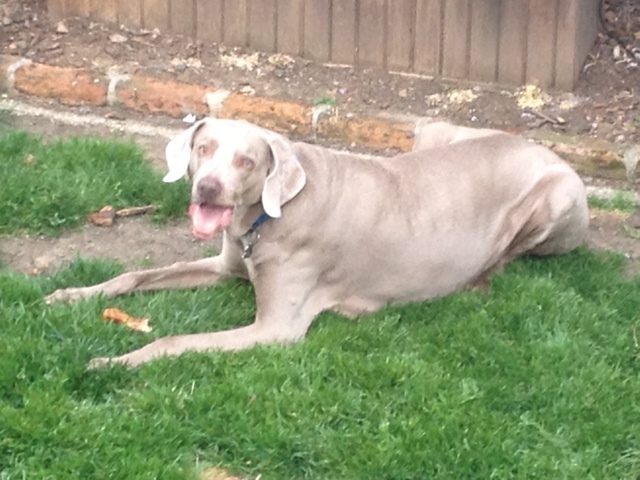 Fatty tumors are common for the Weimaraner. Sometimes they can get giant. Other times they are small. Most never develop into anything serious. Any tumor warrants a Veterinary check.